In a medium saucepan combine the TVP Chiken Strips with the boiling water and simmer 5 minutes. Alternately you may combine strips with boiling water in a microwave safe bowl and cook on full power 3 minutes. Set aside. In a large electric frying pan or Dutch oven, heat oil and dried garlic over medium high heat 1 minute. Add the vegetarian pepperoni and onion, and saute 3 minutes. 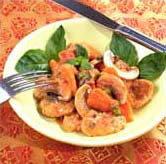 Add the sliced carrots and mushrooms and cook 3 minutes. Add the reconstituted TVP and cook 5 minutes. Reduce heat to medium low and add the wine and the remaining 3/4 cup of broth and cook, stirring occasionally 5 minutes. Place the tomatoes in food processor or blender and add to the mixture. Combine the soymilk with the yeast, whisking to blend and add with the peas, chopped basil, and thyme.Lower heat and simmer, stirring occasionally 10 to 15 minutes.